Those in the know, pegged Salem as one’s to watch after their comeback album, Forgotten Dreams, ushered in a new dawn for these veterans, and their upwards trajectory ever since has been thrilling to witness. 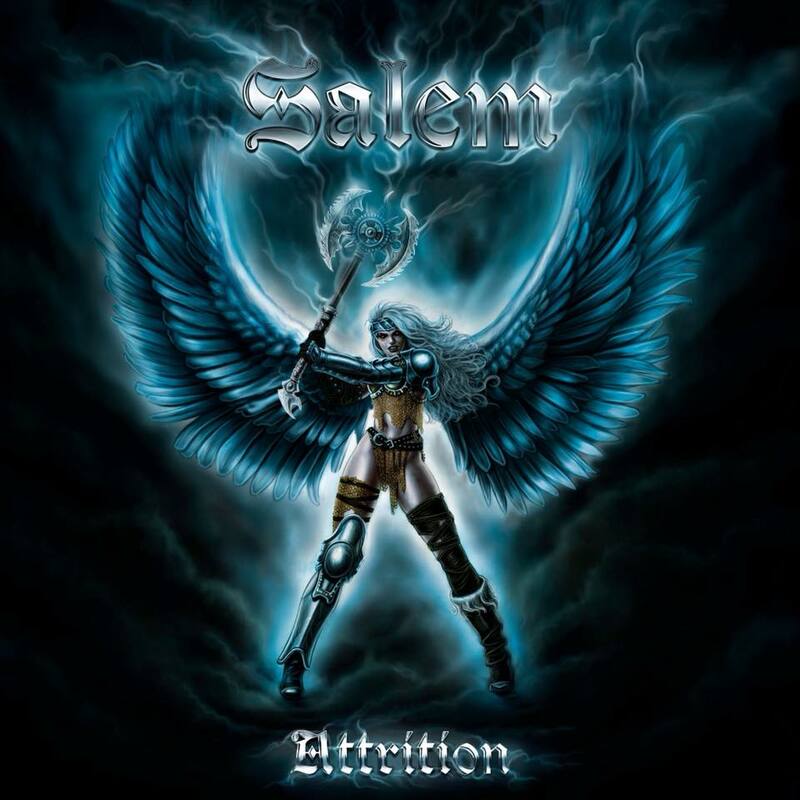 Continuing the trend, Salem’s latest collection of blue-collar hard rock/heavy metal offers a treasure trove of absolute bangers, with 11 tracks of prime UK rock/metal ably recalling the glory days of the New Wave of British Heavy Metal. Attrition‘s self-titled opener is the ideal showcase for Salem’s power, with a classic crunching NWOBHM riff (that transforms itself into an almost atonal mind-scrambler) providing the ideal accompaniment to the kind of huge Saxon-esque chorus Salem deliver so well. Knowing full well that their skill lies in combining power and melody, Attrition covers all the bases and while “Black And White” proves to be Salem’s ‘ballad’ moment – and a fond recollection of simpler times – “Taking Control” is pure NWOBHM genius; a song that reeks of 1980 and the boundless possibilities of a sub-genre that had the world at its fingertips. “Sign me up, I wanna be the headline” sings Simon Saxby in his own inimitable style, and Salem’s desire to pursue the dream that began 3 long decades ago wrings as true now, as it did for Saxon, Iron Maiden, Diamond Head (and Ethel The Frog!) way back when this whole damn thing started! However, it’s the knockout blow of the stomping “Warning Signs” (what an opening riff!) and the bouncy “We Are Gods” which provide Attrition‘s biggest thrills. Featuring stellar vocals and an endless array of timeless riffing, these are the kind of tracks that confirm Salem are here to stay. Nostalgia be damned, Salem aren’t on a NWOBHM trip….they’re here to remind the world why us Brits were so damn good at this rock and metal lark in the first place! Will 2015 Bring Us A New Iron Maiden Album?